Either it is possessed or it is housing an alien inside it. The boiler was installed in 2013 for a pretty penny. It looks like the space station in my basement with the 5 zones. (Figures an alien would eventually find it.) A hot water tank was also installed. Last April it started making these groaning noises really badly. We turned off the heat we were so scared. The heating company that installed it came out and did some stuff to it but after that things got warm so we never really heard it again. Thanksgiving it turned cold and the furnace started groaning and shaking every day, but intermittently. Mostly it groans for a max of 15 minutes but usually for much less time. It has been getting worse/more frequent. I've been taking video of what has been happening to prove I'm not crazy and the alien is really down there. I asked him if they had called Burnham to see if this was a problem with the boiler, and they said that Burnham wouldn't do anything unless we did this stuff first. I'm leaning towards saying go with the expensive high efficiency tune up check the combustion rather than the flush heat exchanger to see if that will work. 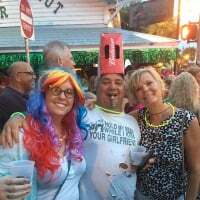 Here is a link to folders with videos and pictures of when it was happening. You can look at the timestamps on the files to piece together what happened when if you have to. I tried to take pics of the zones, the gauge (once I realized it was there) and the control panel (but I don't think I knew which screens were most important.) If it happens again and you tell me what screen to look at and I'm here, I'd be happy to video it for you. The only thing I know for sure is that it isn't tied to just one zone. Here are some notes that I took while it was happening twice, but the video of the groans are probably better. I'm guessing the screen shots of the screen probably don't matter either? Because the noise doesn't show up on them. Boiler got to 155 and it was shaking. Water? Started and then it immediately stopped. Boiler temp started going down from 155 rapidly. Got down to 137. Then said preignition test. Then running. Immediately started climbing again. Went down to 166 and stayed between 166 and 167. No sound. Boiler temps dropping to 150. Went pack to prepurge at 150. Drive light off. Energy save on. Boiler dropping. Running...noise happening (just for a minute or two because I was downstairs when it started). Safe startup. Noise stopped. Prepurge. Purge. Climbed to 146 and I grabbed more video because, I think, this was the first time that the noise happened again after the cool down cycle. It may have happened this way other times but this was the first time I was there when it happened. So you had a boiler installed and now you seem annoyed that it needs service. It's been 4-5 years. Do you realize this equipment should be checked every year?? You wouldn't be able to drive a car 4-5 years without doing some service to it? Your car probably cost more than your boiler. The boiler It needs service. Like @EBEBRATT said, any heating system should have an annual maintenance. A combustion analysis should not be an extra cost. It must be done as part of the maintenance or anytime the boiler itself is serviced. Make sure they leave you a print out of the combustion analysis. That boiler has serious short cycling issues. The delta T is way too low. My mod. con. is 4 years old and I have cleaned the flame sensor once, thats all I've done. You should however follow the manufactures instructions on maintenance. 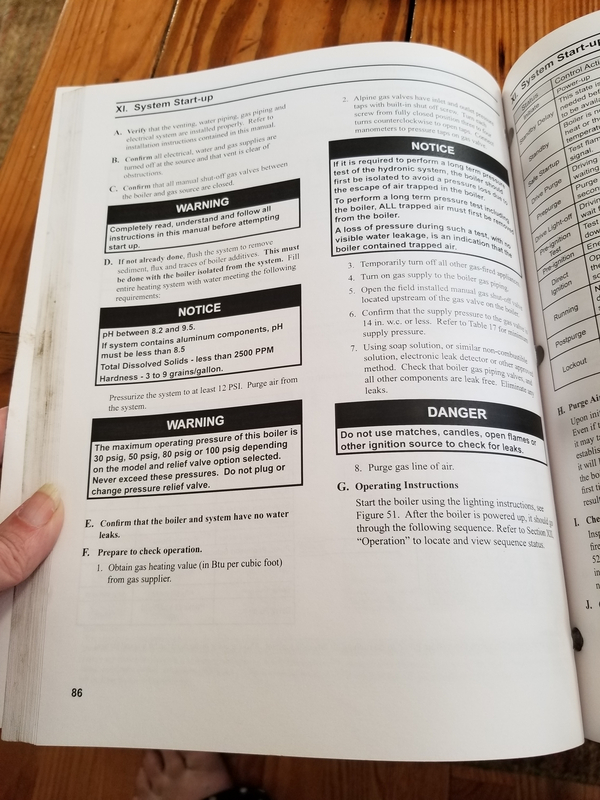 Most likely the home owner was not informed if this brand of boiler requires expensive yearly maintenance for if he had he probably would not have purchased it. The pressure gauge is at 30#. Not good. 55K plus cycles 11K hours of run time. Not good and indicate installation not maintenance issues. Ebebratt, you are right, they never told us that it would require a huge chunk of money to maintain every year, and you are right, we would not have purchased it if we had known. This boiler was supposed to save us money versus our old one. They supposedly did this maintenance in the spring, changed filters (way more than changing car filters -- 10 times more) or whatever for a good chunk of change. They are telling me that the burner is running fine and none of the gauges show any problems so we should clean it before Burnham is called. I know computers, but I don't know boilers. I have the manual, but it is as gibberish to me as deploying a website on an aspx platform versus a Linux platform is to most people. "The pressure gauge is at 30#. Not good. 55K plus cycles 11K hours of run time." My huge question is this going to blow up on me? after 4-5 years it needs service. The question is getting someone competent. If the boiler is short cycling itself to death that is very hard on the equipment. You need someone who can not only service it correctly but someone who can diagnose not only the boiler but the entire heating system. Only then will service cost, comfort and long term efficiency and maintenance cost be reduced. Not sure that your existing contractor is the right one. Have you tried find a contractor on this site?? A few questions about your equipment. 1. 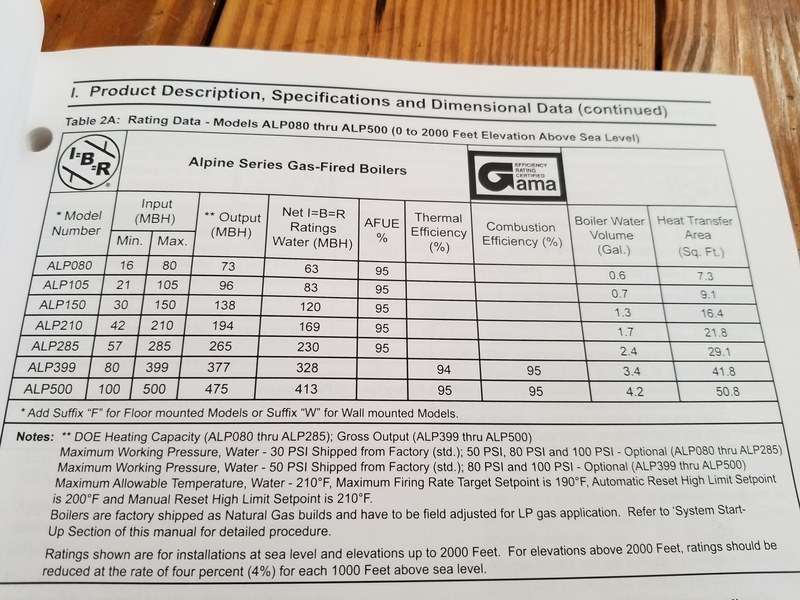 What model boiler and what is the rated input? 3. How much/total amount of radiation? OK, we have forced hot water. About 3600 square feet. 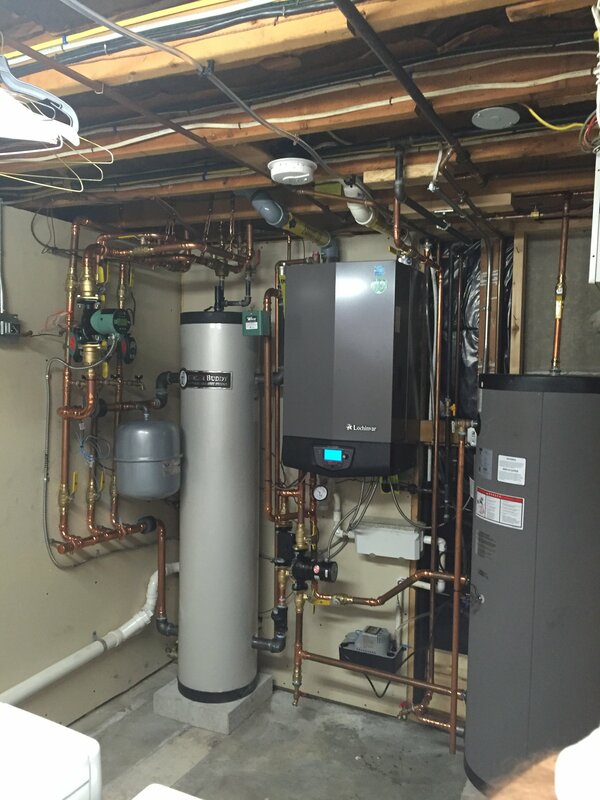 An Alpine Burnham 210 with Hot water heater off the same system. The boiler is sized at 50 BTUs per hour per square foot. Can you post radiator photos? How old is the house and is it insulated? Is the whole house baseboard? If it is measure the length of each one and let the wall know how many feet of baseboard their is. Sounds like a control issue within the boiler. That boiler should modulate down to 42,00btu. I suspect it is oversized but be able to work without short cycling. We have 5 zones. I can't find the paper with all the stuff that they did in the spring. The whole house is baseboard. I'm getting a measuring tape now. Note: The Garage Laundy zone is set to go on when the Master Zone goes on. We had a freezing problem in our hallway near the garage and that is how we make sure it doesn't freeze again. We are in the Northeast near Boston. The house is built in 1963 or so. It was done over in 1993, but the insulation is not stellar. Hmmm... if we count the basement and the garage, it may be 4000 square feet? We don't have a full basement because we are on rock. The hallway where we had the freeze issue has baseboard but the water runs right underneath the slab for the hallway and the bathroom laundry area. Make sure to only count the finned length of the baseboards. Sometimes installers run pipe without fins in the baseboard enclosures, this unfinned pipe is not counted in baseboard length. The boiler will short cycle if only one short zone is calling since the boiler on low fire exceeds the output of 45 feet of typical baseboard. If you could combine the 4 short zones into two it wont cycle as much. 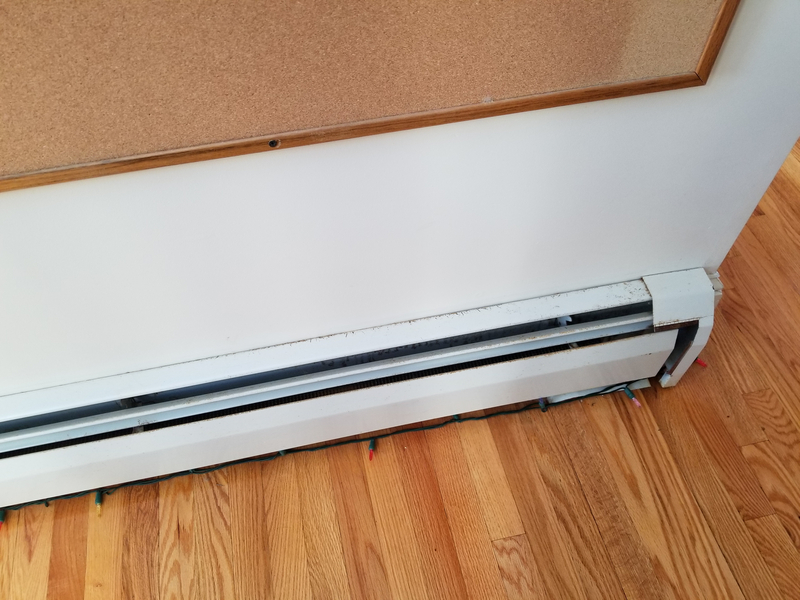 How is the baseboard? Are the fins clean, free of dust and hair? Is air circulation through the baseboards blocked or restricted by rugs or furniture? The house had five zones from the start in 1963 and they are all distinct areas of the house. Some rooms have furniture against the baseboards, and in the dining room area we have curtains, but they only block about 1/6th of the area. Is the short cycling contributing to the noise? Thats only about 130K worth of baseboard. When all zones are on. Problem solved. Your boiler is about 3 times too big. I am getting 256 feet of baseboard @ about 600btu/foot (which it may not even be that much) your baseboard will produce 55,364 btus/ hour. Your boiler is capable of heating 169,000btu of baseboard. @unclejohn where are you getting 130k of baseboard? @KProuty are you sure that is it for baseboard? MY MISTAKE MUST HAVE HIT THE WRONG CALCULATOR BUTTON. Call Burnham or local wholesaler. Ask for names of contractors in your area who install, service and have been trained on the Burnham Alpine condensing gas boilers. This boiler can be down fired. Contractor might want to look at installing a Hydronic buffer tank to give your system water volume and then run the zones off the buffer tank. If there are pumps for each zone you could be over pumping your system. Might be better with one ECM pump and zone valves. Over sized boiler along with small heating zones will short cycle the boiler on and off to fast and to often. This kills boilers early. The alpine is a good boiler. There are many good condensing gas boilers on the market and you can buy the best boiler but if it is not installed the right way these boilers will live a very short life. You need someone who knows what they are doing. Ask the installing contractor to bring the local Burnham rep out to the job to look at the boiler. Ask him what needs to be corrected to make your system run right. Ask installing contractor to correct the problem. They sold you the job and if they installed it wrong it is not your fault. Condensing boilers along with all other boilers and heating systems needs yearly maintenance no questions asked. We have separate pumps. If you look at this url you will see the pumps in pics and in the videos we shot. Get the original contractor to bring the local Burnham rep out plus someone from the wholesaler where they bought the product from. There is always a reason why the boiler is doing what it is doing. A good condensing gas boiler if installed right and has proper maintenance should last 15 to 20 years or longer. Things that can shorten a condensing boilers life. Over sizing (to big BTU boiler input) causing short cycling on and off to often and to short run time. Not doing proper near boiler piping. Not doing proper air removal from boiler system. Not venting the boiler right. Cross contamination bring exhaust gas back into the boiler instead of fresh air. Small micro zones. Causing the boiler to short cycle. Over pumping the secondary zones. Primary pump not sized right causing not to have proper water flow through the boiler heat exchanger. Contractor not setting the boiler up at start up with testing equipment to make sure the boiler is set up and firing according to manufacture specs with digital read out. Home owner not having proper yearly maintenance. Not saying all of these things are in your system but there is something that is wrong and need someone to be fixed. 5ere is no alian living in your boiler but it is talking to you saying there’s is something wrong help me. I am not picking on the installing contractor but what ever is wrong needs to be corrected. Click on this he could be in your boiler trying to get out. I hope you get your problem fixed. @EBEBRATT-Ed I use 500 BTU per foot. Just another note the Alpine 210 according to the manual should be piped in 1-1/4". Is your boiler piped in 1" in and out of the boiler to the close spaced tee's? My experience with that scene is that the installer did not complete a primary/secondary near boiler piping arrangement. I repiped and no noise( low flo in boiler -steam pockets) As rbeck expressed in an other way. Have you solved prob yet? Everything I’ve read indicates that it was never set up correctly to begin with and the second guy was just incompetent. I believe it to be a gas pressure problem or to do with the combustion mixture. Update: So this guy was so confident in what the problem was, that he didn’t even put a gauge on it. He simply adjusted the gas valve with a screwdriver and fired it up (repeating this process until he was happy). So the noise that’s always been there is now gone. And no sign of the less frequent “cold weather pulsing” so far. Side note: last week was colder than this week and there was no trouble last week. Only other difference is that it’s much windier this week. We’ll see what happens now. @EBEBRATT-Ed, perhaps he is or I am... If I would have asked and paid him for the “full service” call, I’m sure he would have gone through the whole thing. But since he solved my apparent problem, I only paid for that... It was “serviced” last year with the Burnham rep on the phone, I guess I assumed all else was good. Anyway, it’s been about 18 hrs and it’s so quiet now I forget about it. I paid for a High-Efficiency Tune up, costs a bunch, and it included pulling the burner, clean the chamber, and test combustion. It turns out that the mixture was bad for low fire? I guess that means when the burner wasn't working hard. Remember, the noise started in the spring when it was starting to warm up in the northeast and resumed again when it started to cool down in the fall. We had to wait a week for them to come and do the tuneup and in that time temps plunged and we didn't hear the noise. So far it has been a couple of weeks with all sorts of temp ranges and everything seems to be A OK now. So, if someone else has this problem, a good combustion test and adjustment should probably fix it. Hope this whole thing can help others not have to go through what we did. Thanks guys for trying to educate a newbie home owner. NEXT boiler we install, I'm going to ask a bunch more informed questions. Oh, and BTW, this forum saved us some big money. We decided to do the Tune-Up only rather than add on the other expensive flush heat exchanger and chemical clean boiler for a 4-year old boiler thanks to parsing advice on here. That fixed it and saved us some big money. Mod-Con boilers have good efficiency but like everything else it comes with a price. No free rides. If you have it serviced occasionally it should be fine. The real problem is finding the right technician to work on it. Ya know what that guy knew what he was doing, those units other than that issue have been extreamly reliable...And yes a combustion and gas pressure check are a real good way to start the job....It’s also a good idea but seldom done is to keep a record on the turns, but if all else fails there is a simple procedure to get it back close to factory settings.....Never did an emissions test when we used to have a blast adjusting carborators in power mechanics class 1969.. Looking at your exhaust and air intake, I would have done it differently. 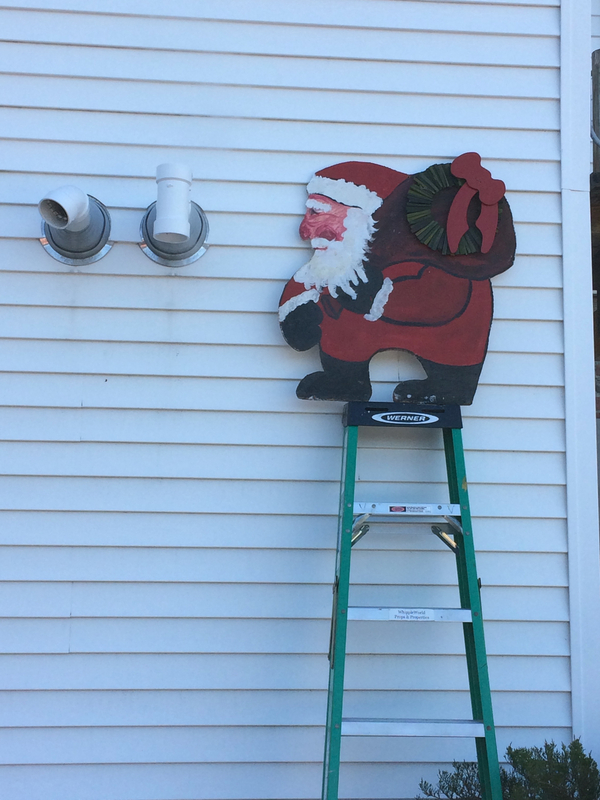 I am concerned about gas reversion and never use concentric venting and when I use a two pipe system like yours, I always put the exhaust vent 18" higher than the air intake vent with a 45 deg take off on the exhaust vent raising it 18". This may sound crazy, but I'm half crazy anyway and working on the other half. So, let me ask you about the water quality in your boiler. You have an aluminum HX and the manufacturer's requirements as to water quality must be conformed with and checked on a yearly basis. Was your boiler filled with tap water and is that water mineralized to any degree? Is there any chance that the inside of the HX has a carbonate build up and that is causing your groaning? Sounds like expansion in the HX. Other than that, I would look at combustion and have it analyzed. Hopefully, it was done at commissioning. Maybe call an exorcist? hmmmm.